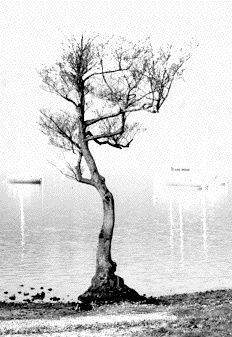 The tree stood on a small hummock by the water's edge. Like those Bonsai crafted roots around a rocky outcrop. It was not a large tree, grey bark, straight trunk rising to just above the height of a man before it branched. Too symmetric for a Bonsai. The rough bark was coloured by lichen, but I could not make out the details at this distance. Perched on the water's edge surrounded by the lakeside gravel beach. The lake was glassy, not totally smooth, but sufficiently so that each boat mast and rigging line thrust straight downwards where water should have been. How, if, as they say, we developed as water-edge creatures on the African coastline, how is it that our eyes are so confused by reflections, that the water that starts near me should seem to stand vertical as a distant mast springs from my feet? They used to believe that life started at these edge places, now the source has itself been thrust deeper into the heart of things: to deep sea vents spewing sulphurous gases, then deeper still into the solid rock that used to seem just the superstructure on which the biosphere balanced. But still it is flux that drives life whether the tortuous flux of volcanic springs or the slow leaching chemicals in microscopic subterranean fissures. Life is always at the interstices. But the tree does not perch on a pre-formed rock, the tree is not there because the hummock is there to support it, the hummock is there because the roots of the tree have held the earth together against the slow beat of the waves. As Lovelock showed us life adapts its environment: making, forming. The tree roots did not gather themselves an earthy island, but they have held on to it. And along the lakeshore the faint undulations of shoreline often reflect the larger trees set on the grass behind: beneath the ground vast root systems marking territory. Just like the swan that moments before languorously broke into flight, wing tips catching the scattering surface and drove towards two others, interlopers, who knowing their unbelonging took flight so that the three flew feather to feather until at the edge of his domain the waterlord lands (as if that were the right word) to patrol again his boundaries and the pretenders sweep far away out of sight over the lake. Or like the pungent odour of fox urine along the hedge-side. Towards the base of the tree is a dark hole, perhaps where a branch once fell away. As the damp air feeds fungal decay, some day the trunk will break and fall, and as the orphaned roots decay the tree-formed islet will itself decay until all that remains is a shifted shoreline. Patterns, patterns everywhere: explanations, reasons, a web of life connected behind each tiny incident. Is it just the workings of my own fevered brain projecting patterns on the arbitrary? We all do this, we are pattern seeking creatures, but rightly so, the world is filled with order as well as the arbitrary. The tree need not have been at that point on that lake, the swan need not have been there, but there would have been other patterns to see. But I see chaos too and know it for what it is. Randomness, statistics, chaos theory with its strange attractors, and oddly beautiful Mandlebrot and Julia sets. Chaos understood and with its own structures and patterns, yet always having the contingent the arbitrary within it. Indeed all of life depends on this meeting of pattern and chaos. If the world were all chaos then there would be no life, there could be no development, no finding of niches, no adaption, chance organic molecules thrown together would by equal chance separate again. But if the order were too simple then the simplest crystalline structure or sub-microbe that by chance or adaption matched that pattern would flood and sate creation. It is the more subtle patterns, those that need more complexity of being to understand and comprehend, whether comprehend physically, like the tree roots in the soil, or intellectually; it is these patterns that demand more life, more mind, more spirit. Just as in the deeps of the earth microbes take their life from slight gradients of chemical concentrations and all life feeds on entropy flow, taking its energy in the millstream from order to disorder. Just like this, in a way all life also depends on this more abstract intellectual or informational flow between pattern and chaos. I suppose if I were a person of unutterable faith in the emptiness of the cosmos, I might attribute it all, against all reason, to shear chance that pattern exists at all. The sense in the universe is mere happenstance. Or I guess, if I were more egocentric than even I am, perhaps I should adopt a strong Alan-thropic principle: the world could only be the way it is because otherwise I could not be here to wonder. But I lack that blind faith in the blindness of things or that clinical view that sets the observation of the objective world purely in the lap of our subjective accident of being. Clearly I am no true scientist. We find fulfillment in those things that sit in these boundaries: in Csikszentimihalyi's psychology of experience - flow lies between anxiety and boredom, fully engaged at the edge of our physical ability; in education - the zone of proximal development, learning best at the supported edge of our knowledge; in humour - seeing the strange in the ordinary; in poetry - using associations with the familiar to probe the extraordinary. So perhaps the cosmos is as it is because it is a thing of beauty and that is enough, and perhaps the deepest patterns are there within the unfathomable depths of chaos. A single tree by the lakeside.